Okay, so this is not a reference to Future of the Left, but at least it gives you a sense of where I've been at since the date of my last post. Because I've been interminably busy with academic deadlines, et cetera, I thought I would give a round up of things going of late. What kinds of intellectual constellations, if any, are forming in the new scholarship? What are their primary concerns, their premises, and their debates? What role(s) do books play in these formations? At a time when academic publishing is under increased pressure, the conference also affirms the contributions made by such work to defining the parameters of academic inquiry more broadly, and of architecture and urbanism more specifically. Sounds heady, sure, but it promises to be an interesting event, especially considering the appearance of #lgnlgn posts almost a month ago. In terms of publications, be sure to pick up the latest issue of Junk Jet, which features my piece on Dario Argento's Suspiria. Copies are running out, so if you want, you can come to the upcoming Junk Jet release party that will take place in Brooklyn on May 4 May 8 (thanks, Mimi!). You can buy a copy there (details on the event are forthcoming). For those of you interested, I also have a review of Kitty Hauser's Bloody Old Britain in the latest issue of Future Anterior (many thanks to Patrick for securing this gig for me). And finally, a week from today, I will be presenting a paper at the 63rd annual meeting of the Society of Architectural Historians (SAH) in Chicago. I am part of a panel, organized by David Gissen, called "Geography in Modern Architectural Theory and History." My paper is on MoMA's Airways to Peace show from 1943, an "Exhibition of Geography for the Future" that looked at the role that aviation played in the current war as a way to prognosticate about the role that geography would play in postwar representations of the world. Looking at contemporary developments in cartography, the exhibit featured the work of people like Richard Edes Hamilton, Harold H. Sprout, R. Buckminster Fuller, Norman Bel Geddes, Eliot Elisofon, Irving Fisher, and others. 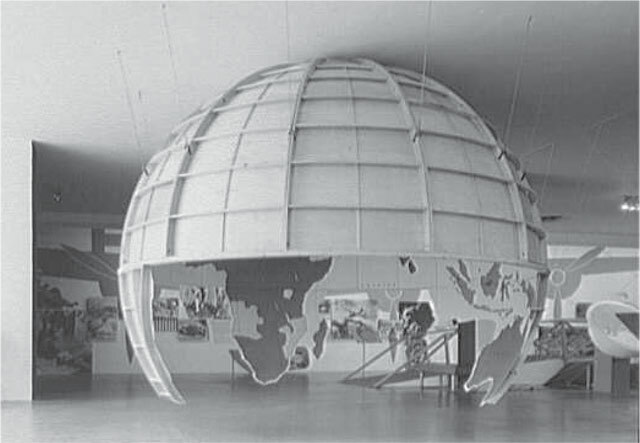 Bauhaus émigré Herbert Bayer, along with future TAC member Sally Harkness, designed the exhibition. I will resume posting soon ... so see you on the other side. ahem, May 8, for Jetistics in Brooklyn. Can't wait! I saw your presentation at SAH, and it was all I could do to not raise my hand during the Q&A session and say, "Aren't you Smokety?" AHAHAHAHA!!!!!! You should've said "hi"!!!! I would have, but I had to dash out, I didn't even get to hear most of the Q&A session. One of the panelists was just asking about how we define geography just as I left--now I'll never know the answer!